Two of ’em, in fact. Needles: Size US1.5 bamboo Clover DPNs. Modifications: Doing an entire first sock and then ripping it out gave me a chance to test out a few things and discover I didn’t like the fit of the specified 1×1 rib cast-on. So, I did my usual cable cast-on followed by the 18 rounds of twisted rib. I refused to cut the yarn after turning the heel, instead picking up the gusset stitches on the first round after the short-rows. Also, I slipped the first stitch on every heel flap row to make picking up those stitches easier. I love these socks. They’re so pretty! And the yarn is soooo soft and luxurious. If it weren’t 90 degrees out, I’d be wearing them right now. Actually, I almost did wear them to work today anyway, but my green blouse is in the wash. Maybe next week. 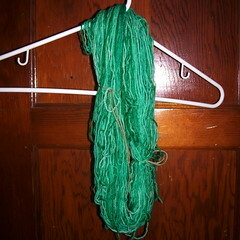 That sad loop of yarn was once almost half of a beautiful skein of Tempted Hand Painted Bad Grrl in the Clover colorway. After that, it was a gorgeous Embossed Leaves sock that was, sadly, too big for my foot, and a little too loose-knit in the gussets. So, I ripped. And ripped. And ripped. It takes surprisingly little time to rip out an entire adult-size lace sock. I wrapped the yarn around the lid of Little Miss’s block box, and then wrapped it again around the back of a chair, tied it in a couple of places, dunked it in the sink, and hung it to dry. It was when I tried to rewind it into a ball that things went really sour. I don’t know what happened. I put the hank on my swift and started winding, and I ended up with one ginormous tangle. I spent 4 hours detangling until the yarn snapped. Twice. At the moment, I have one lovely (properly-sized) Embossed Leaves sock, one sock about 2/3 of the way through the leg and already on the second remnant of yarn, and three more small balls made out of the frogged sock. I am going to have a lot of ends to weave in. K has already renamed this project The Sock of a Thousand Tears. 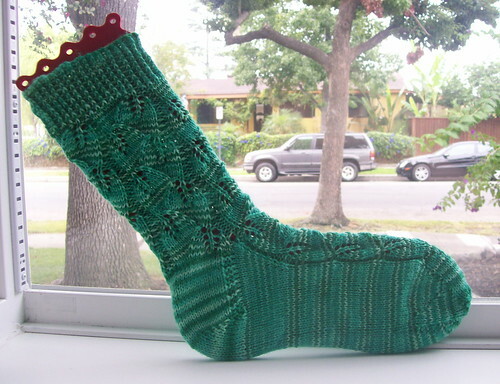 But I love this pattern, and I love this yarn, and I am going to finish this pair of socks. How could I not give it a mate?